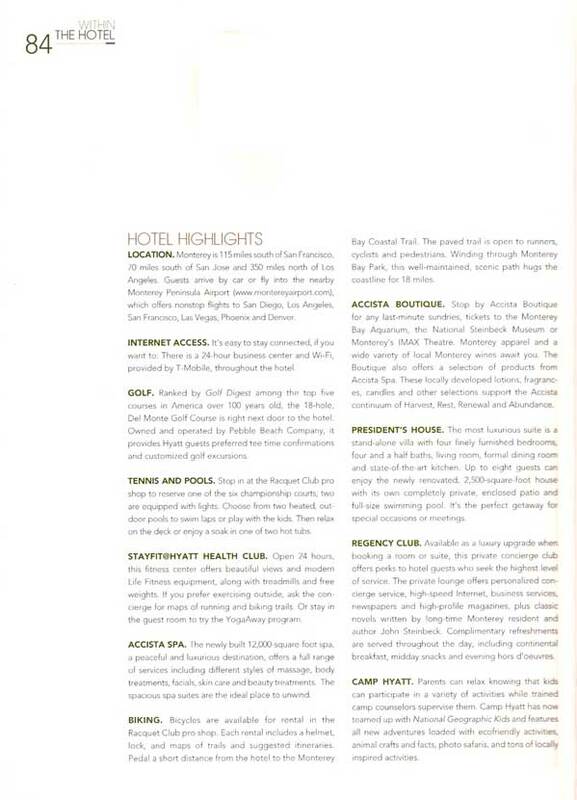 Hyatt Regency Monterey Hotel and Spa on Del Monte Golf Course offers star attractions both inside and out. 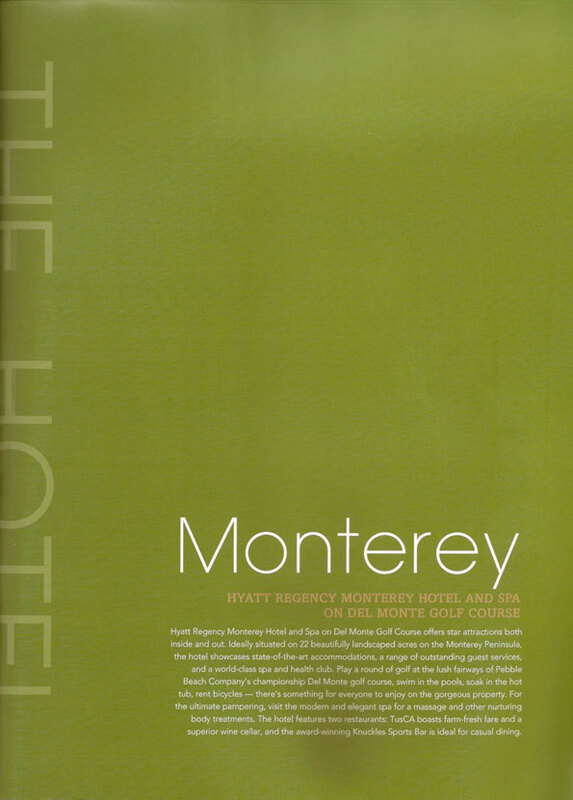 Ideally situated on 22 beautifully landscaped acres on the Monterey Peninsula, the hotel showcases state-of-the-art accommodations, a range of outstanding guest services, and a world-class spa and health club. Play a round of golf at the lush fairways of Pebble Beach Company's championship Del Monte golf course, swim in the pools, soak in the hot tub, rent bicycles - there's something for everyone to enjoy on the gorgeous property. For the ultimate pampering, vista the modern and elegant spa for a massage and other nurturing body treatments. The hotel features two restaurants: TusCA boasts farm-fresh fare and a superior wine cellar, and the award-winning Knuckles Sports Bar is ideal for casual dining. LOCATION. Monterey is 115 miles south of San Francisco, 70 miles south of San Jose and 350 miles north of Los Angeles. Guests arrive by car or fly into the nearby Monterey Peninsula Airport (http://www.montereyairport.com), which offers nonstop flights to San Diego, Los Angeles, San Francisco, Las Vegas, Phoenix and Denver. INTERNET ACCESS. It's easy to stay connected, if you want to: There is a 24-hour business center and Wi-Fi, provided by T-Mobile, throughout the hotel. GOLF. 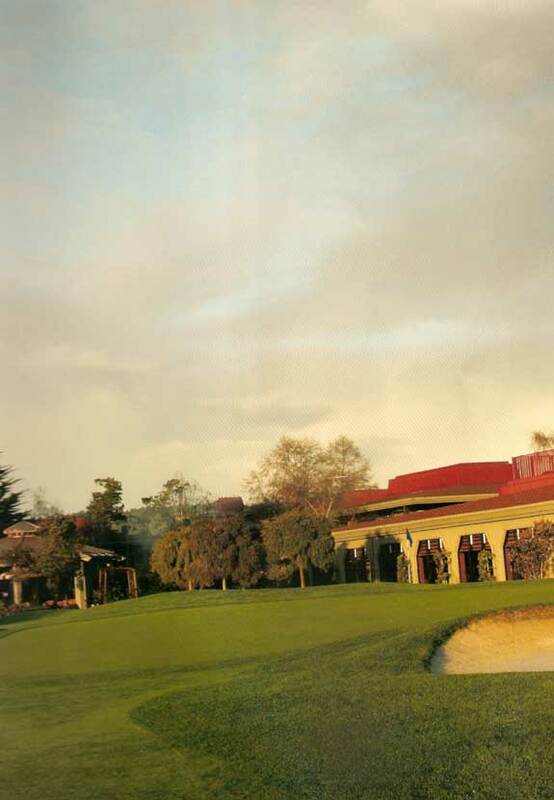 Ranked by Golf Digest among the top five courses in America over 100 years old, the l8-hole, Del Monte Golf Course is right next door to the hotel. 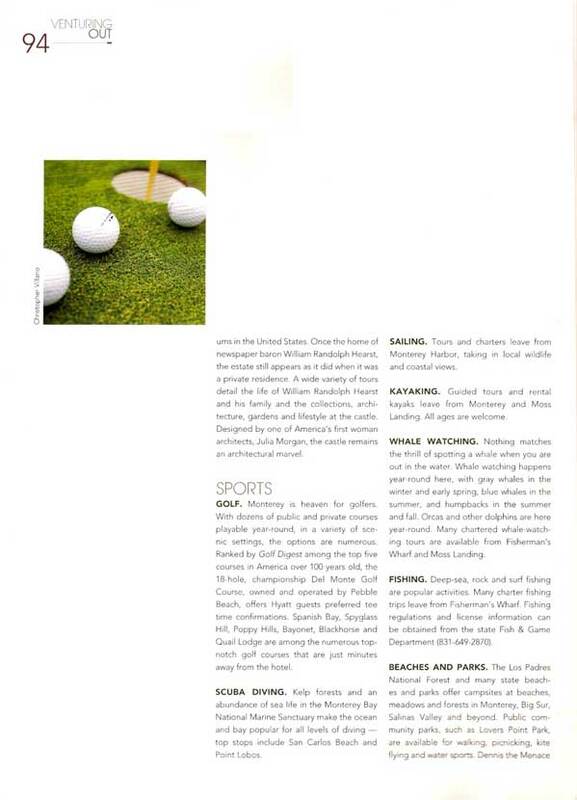 Owned and operated by Pebble Beach Company, it provides Hyatt guests preferred tee time confirmations and customized golf excursions. TENNIS AND POOLS. Stop in at the Racquet Club pro shop to reserve one of the six championship courts; two are equipped with lights. Choose from two heated, outdoor pools to swim laps or play with the kids. Then relax on the deck or enjoy a soak in one of two hot tubs. [email protected] HEALTH CLUB. Open 24 hours, this fitness center offers beautiful views and modern Life Fitness equipment, along with treadmills and free weights. If you prefer exercising outside, ask the concierge for maps of running and biking trails. Or stay in the guest room to try the YogaAway program. ACCISTA SPA. The newly built 12,OOO-square-foot spa, a peaceful and luxurious destination, offers a full range of services including different styles of massage, body treatments, facials, skin care and beauty treatments. The spacious spa suites are the ideal place to unwind. BIKING. Bicycles are available for rental in the Racquet Club pro shop. Each rental includes a helmet, lock, and maps of trails and suggested itineraries. Pedal a short distance from the hotel to the Monterey Bay Coastal Trail. The paved trail is open to runners, cyclists and pedestrians. Winding through Monterey Bay Park, this well-maintained, scenic path hugs the coastline for 18 miles. ACCISTA BOUTIQUE. Stop by Accista Boutique for any last-minute sundries, tickets to the Monterey Bay Aquarium, the National Steinbeck Museum Monterey's IMAX Theatre. Monterey apparel and a wide variety of local Monterey wines await you. The Boutique also offers a selection of products from Accista Spa. These locally developed lotions, fragrances, candles and other selections support the Accista continuum of Harvest, Rest, Renewal and Abundance. PRESIDENT'S HOUSE. The most luxurious suite is a stand-alone villa with four finely furnished bedrooms four and a half baths, living room, formal dining room and state-of-the-art kitchen. Up to eight guests can enjoy the newly renovated, 2,SOO-square-foot house with its own completely private, enclosed patio and full-size swimming pool. It's the perfect getaway for special occasions or meetings. REGENCY CLUB. Available as a luxury upgrade when~ booking a room or suite, this private concierge club offers perks to hotel guests who seek the highest level of service. 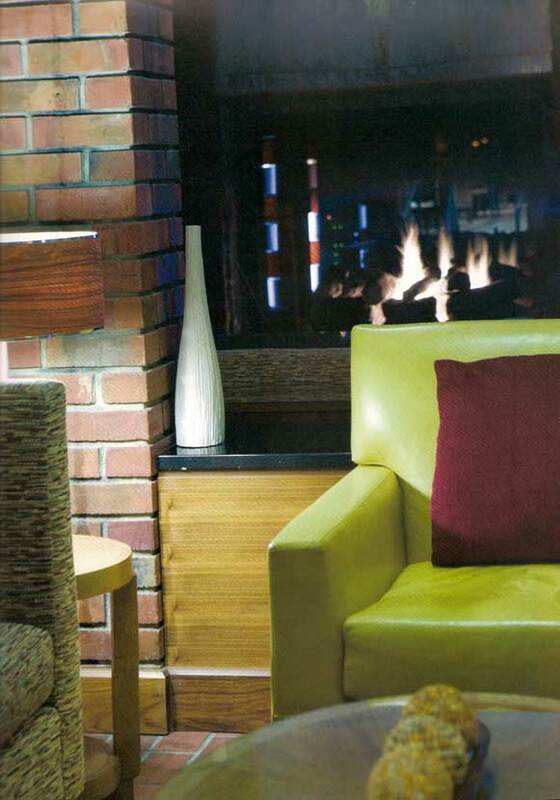 The private lounge offers personalized concierge service, high-speed Internet, business services, newspapers and high-profile magazines, plus classic novels written by long-time Monterey resident and author John Steinbeck. Complimentary refreshments are served throughout the day, including continental breakfast, midday snacks and evening hors d'oeuvres. 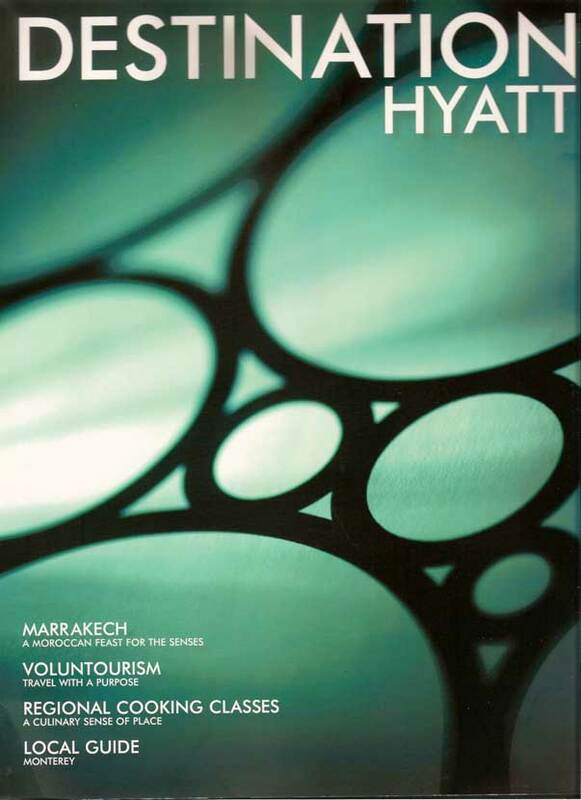 CAMP HYATT. Parents can relax knowing that kids can participate in a variety of activities while trained camp counselors supervise them. Camp Hyatt has no teamed up with National Geographic Kids and features all new adventures loaded with ecofriendly activities, animal crafts and facts, photo safaris, and tons of locally inspired activities. TUSCA RISTORANTE. Named for a blend of Tuscany's renowned flavors and California's famously fresh produce, this handsome restaurant boasts a diverse wine list that pairs beautifully with the entrees served from the open kitchen. Tuscan-inspired duo brick ovens make al forgo (roasted) dishes a specialty. 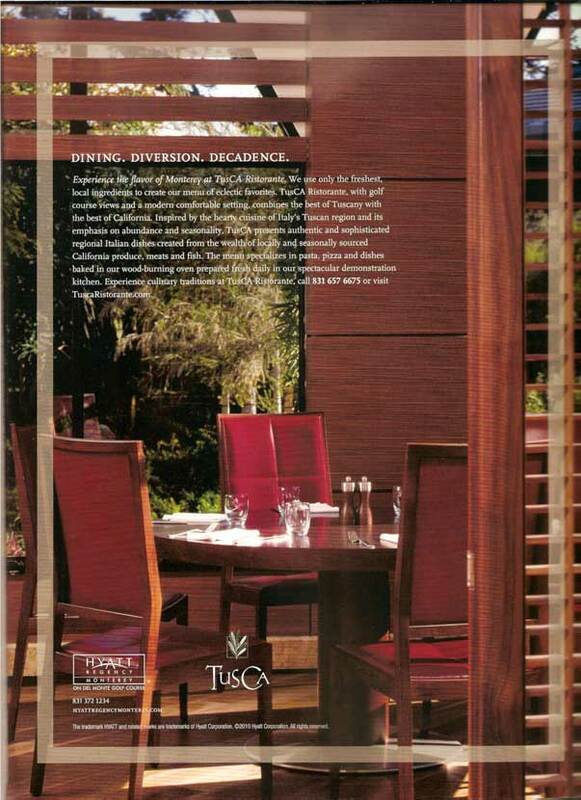 With a stunning view of the rolling greens of the golf course, T usCA offers both indoor and outdoor seating. For a special experience, reserve the Chef's Table (for up to 10) or the private dining room (for eight). 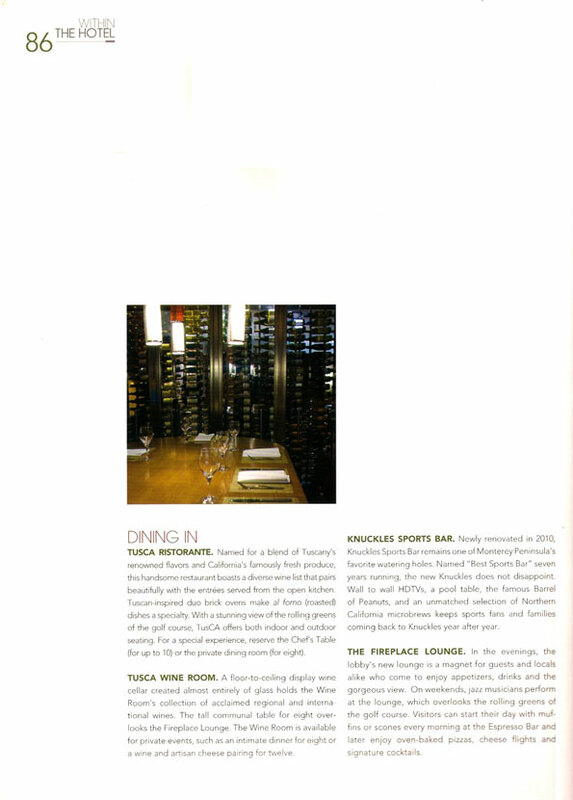 TUSCA WINE ROOM. A floor-to-ceiling display wine cellar created almost entirely of glass holds the Wine Room. 's collection of acclaimed regional and international wines. The tall communal table for eight overlooks the Fireplace Lounge. The Wine Room is available for private events, such as an intimate dinner for eight or a wine and artisan cheese pairing for twelve. KNUCKLES SPORTS BAR. Newly renovated in 2010 Knuckles Sports Bar remains one of Monterey Peninsula's favorite watering holes. Named "Best Sports Bar" seven years running, the new Knuckles does not disappoint. Wall to wall HDTVs, a pool table, the famous Barrel of Peanuts, and an unmatched selection of Northern California microbrews keeps sports fans and families coming back to Knuckles year after year. THE FIREPLACE LOUNGE. In the evenings. the lobby's new lounge is a magnet for guests and local!s alike who come to enjoy appetizers, drinks and the gorgeous view. On weekends, jazz musicians perform at the lounge, which overlooks the rolling greens of the golf Course. Visitors can start their day with muffins or scones every morning at the Espresso Bar and later enjoy oven baked pizzas, cheese flights and signature cocktails. 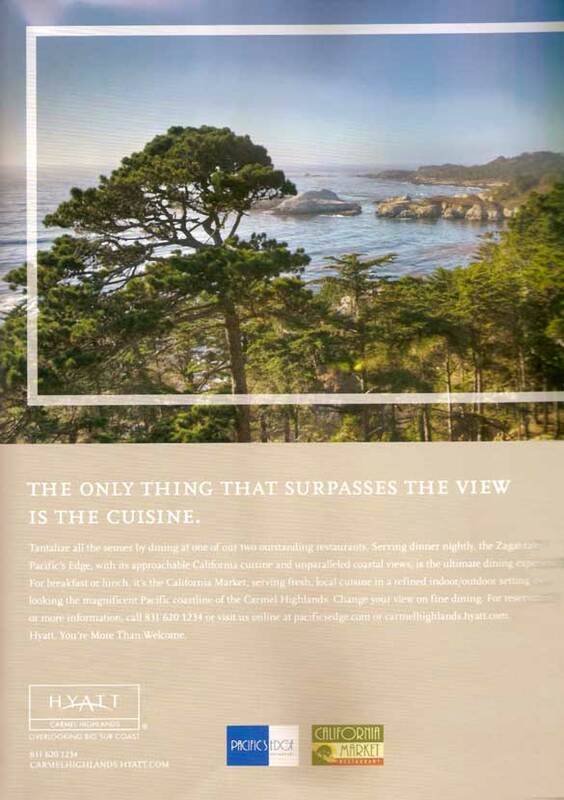 Located on the Central Coast of California, yet known worldwide, Monterey beckons all kinds of visitors. Fill every moment with amazing activities and sports events or spend hours in the park, at a historic mission or reading by the ocean. Most visitors combine active and relaxing pursuits for the ideal blend. There's never a dull moment in Monterey. Golf tournaments, rodeos, car races, bicycle festivals, air shows, tributes to authors John Steinbeck and Robinson Jeffers pack the calendar. Annual festivals honor the artichoke, squid, clam chowder, tomatoes and wine. The most popular events, the Monterey Jazz Festival, the Monterey Blues Festival! and the Carmel Bach Festival, draw international acclaim. A great way to explore some of the most popular sites in the area, is a stroll along Monterey's dramatic waterfront. Spot frolicking sea otters, sharks, fish and other animals that five in the Monterey Bay National Marine Sanctuary. To appreciate the rich vegetation and flowers, pick one of the many parks and gardens in Monterey County. At the beach, keep an eye out for the southern migration of whales. Summer and fall are perfect to enjoy longer stays at the beaches. For more active visitors, sports may be the ticket. Experience Monterey on the golf course, by bicycle, kayak or even skydiving. The stellar golf courses in Monterey attract top-notch players to star-studded events. You'll find many places to paddle, scuba or surf. The pristine beaches stretch along 99 fabulous miles of coastline and there are some ideal surfing spots. Visitors from around the world come to Monterey to see its famous attractions, including the Monterey Bay Aquarium, Cannery Row, Fisherman's Wharf and 17.Mile Drive. The aquarium is located on Cannery Row, a fantastic place to walk around, people-watch and dine. Named for the novel by John Steinbeck, a Monterey resident, Cannery Row is a bustling hub filled with wonderful restaurants, galleries, shops and an IMAX theater. A visit to Monterey County would be incomplete without a culinary exploration. 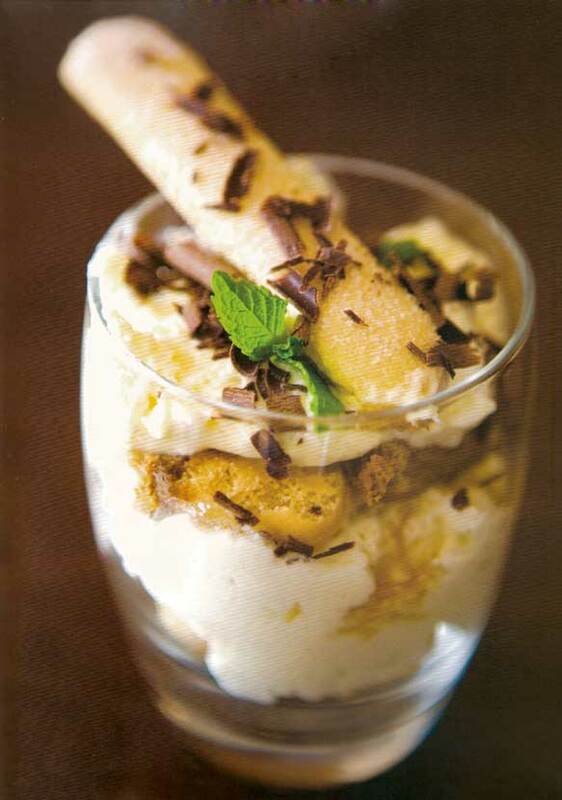 So be sure to set aside time to sample the food lovers' paradise. Restaurants and markets feature fresh, organic fruits and vegetables while regional vintners produce the finest wines. 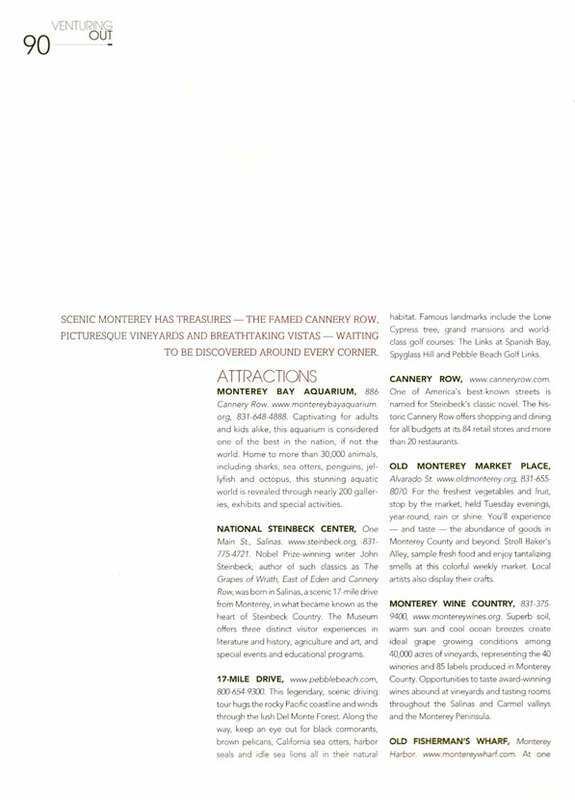 Whatever your appetite for fine dining, adventures and attractions may be, Monterey is sure to satisfy! Scenic Monterey has treasures - the famed cannery row, picturesque vineyards and breathtaking vistas - waiting to be discovered around every corner. MONTEREY BAY AQUARIUM, 886 Cannery Row. www.montereybayaquarium.org, 831-648-4888. Captivating for adults and kids alike, this aquarium is considered one of the best in the nation, if not the world. Home to more than 30,000 animals, including sharks, sea otters, penguins, jellyfish and Octopus, this stunning aquatic world is revealed through nearly 200 galleries, exhibits and special activities. CANNERY ROW, www.canneryrow.com. One of America's best.known streets is named for Steinbeck's classic novel. The historic Cannery Row offers shopping and dining for all budgets at its 84 retail stores and more than 20 restaurants. NATIONAL STEINBECK CENTER, One Main St., Salinas. www.steinbeck.org, 831-775-4721. Nobel Prize-winning writer John Steinbeck, author of such classics as The Grapes of Wrath, East of Eden and Cannery Row, was born in Salinas, a scenic 17-mile drive from Monterey, in what became known as the heart of Steinbeck Country. The Museum offers three distinct visitor experiences in literature and history, agriculture and art, and special events and educational programs. OLD MONTEREY MARKET PLACE, Alvarado St. 831-655-8070 For the freshest vegetables and fruit, stop by the market, held Tuesday evenings, year~round, rain or shine. You'll experience - and taste - the abundance of goods in Monterey County and beyond. Stroll Baker's Alley, sample fresh food and enjoy tantalizing smells at this colorful weekly market. Local artists also display their crafts. 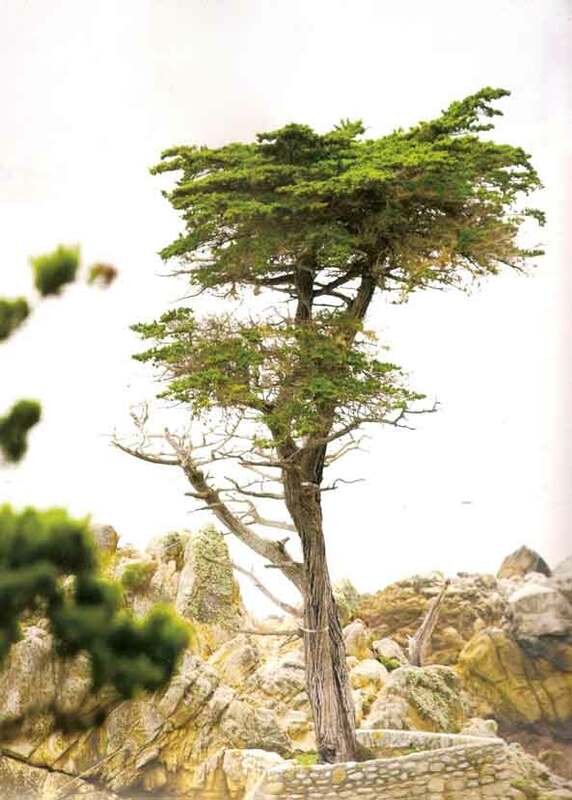 17.MILE DRIVE, www.pebblebeach.com, 800-654-9300. This legendary, scenic driving tour hugs the rocky Pacific coastline and winds through the lush Del Monte Forest Along the way, keep an eye out for black cormorants. brown pelicans, California sea otters. harbor seals and idle sea lions all in their natural habitat. Famous landmarks include the lone Cypress tree, grand mansions and world class golf courses: The Links at Spanish Bay, Spyglass Hill and Pebble Beach Golf Links. MONTEREY WINE COUNTRY, 831-375-9400, www.monterywines.org. Superb soil, warm sun and cool Ocean breezes create ideal grape growing Conditions among 40,000 acres of vineyards, representing the 40 wineries and 85 labels produced in Monterey County. 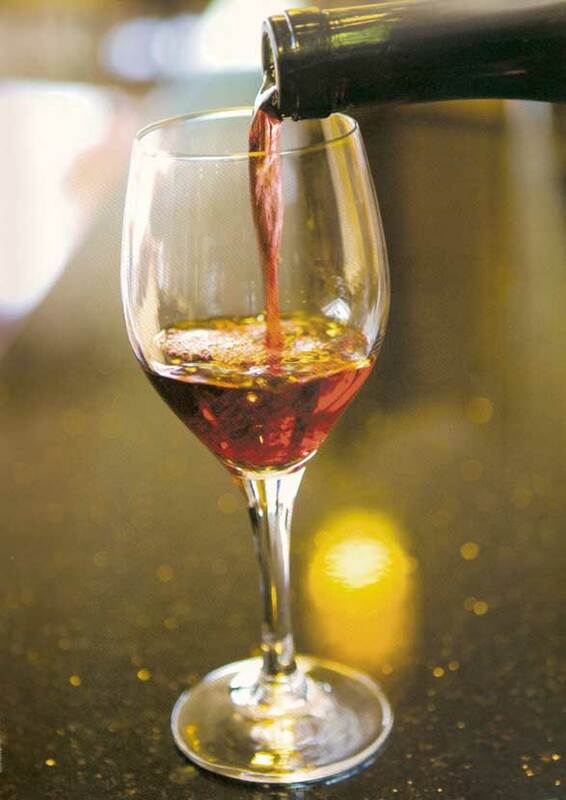 Opportunities to taste award winning wines abound at vineyards and tasting rooms throughout the Salinas and Carmel valleys and the Monterey Peninsula. OLD FISHERMAN’S WARF, Monterey Harbor. 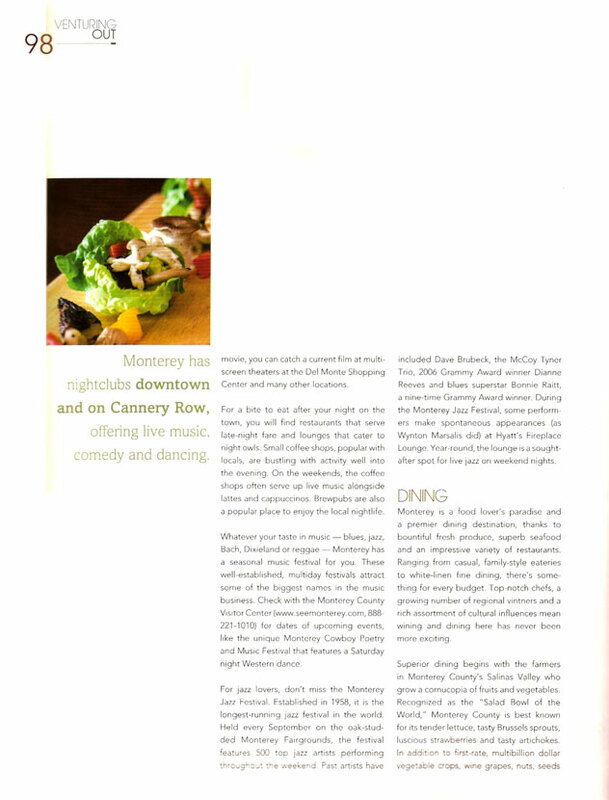 www.montereywharf.com. At one time, tons of sardines were shipped here daily, now visitors enjoy the Wharf's many fine restaurants, gift shops, art galleries, tackle and bait shops, fishing, whale-watching harbor cruises, and party boat concessions. The Wharf Theater presents quality plays throughout the year. MONTEREY STATE HISTORIC PARK, 20 Custom House Plaza. 831-649-7118. A great way to launch your exploration of Monterey is by stepping into the past on the "Monterey Walking Path of History." There, you can view the site where Spanish explorers first landed in Monterey in 1602. Take a guided tour to see the inside of the historic Stevenson House, Larkin House, Cooper-Molera Adobe and Casa Soberanes. The guided walking tours are all free. See one of the nation's last remaining whalebone sidewalks, stroll the same streets that famed author Robert Louis Stevenson walked in 1879 and explore a two-mile path, seeing some of California's most historic buildings and beautiful gardens along the way. MY MUSEUM MONTEREY COUNTY YOUTH MUSEUM. 425 Washington 5t. 831-649-6444. www.mymuseum.org. This museum has relocated and spread out into a new, 8,500-square-foot space conveniently located near Dennis the Menace Park and the Monterey Sports Center. Kids will enjoy many hands-on exhibits. Check the events calendar for special drop-in story times and playtimes. Adults age 18 and over need to accompany the kids. SANTA CRUZ BEACH BOARDWALK, 400 Beach 5t. www.beachboardwalk.com. 831-423-5590. California's only seaside amusement park features rides, laser tag, mini-golf and is home to the world-famous Giant Dipper roller coaster. Munch kettle corn, savor homemade saltwater taffy and feel the ocean breeze as you stroll along the boardwalk. During the summer months, free Friday evening concerts on the beach attract families. CARMEL-BY-THE-SEA, www.carmel california.org. Known as the home of director Clint Eastwood, this quaint village features pretty gardens, boutique shops, fabulous restaurants and 100+ art galleries. The oldtown charm is a delight for shoppers, sun worshippers and foodies. A beautiful pine forest stands near white sand beaches. BIG SUR, www.bigsurcalifornia.org. 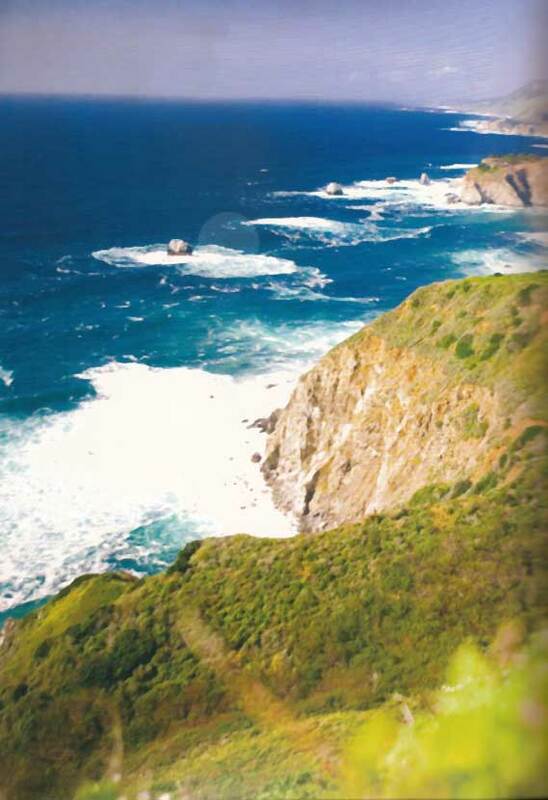 This breathtaking 90 miles of dramatic coastline is a winding wonderland from Carmel south to Hearst Castle. This portion of California Route 1 is designated an American National Scenic Byway and California Scenic Highway, an honor reserved for highways so distinctive they are destinations unto themselves. Discover fine restaurants, inns and park hiking along the way. HEARST CASTLE, 750 Hearst Castle Road, San Simeon. 800-444-4445. 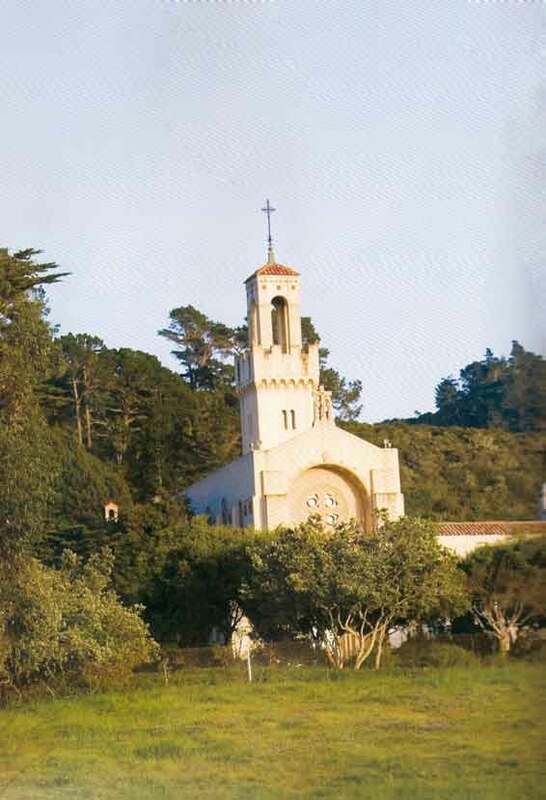 About a three-hour drive from Monterey, Hearst Castle, operated by California State Parks, is one of the largest of approximately 5,000 historic house museums in the United States. Once the home of newspaper baron William Randolph Hearst, the estate still appears as it did when it was a private residence. A wide variety of tours detail the life of William Randolph Hearst and his family and the collections, architecture, gardens and lifestyle at the castle. Designed by one of America's first woman architects, Julia Morgan, the castle remains an architectural marvel. 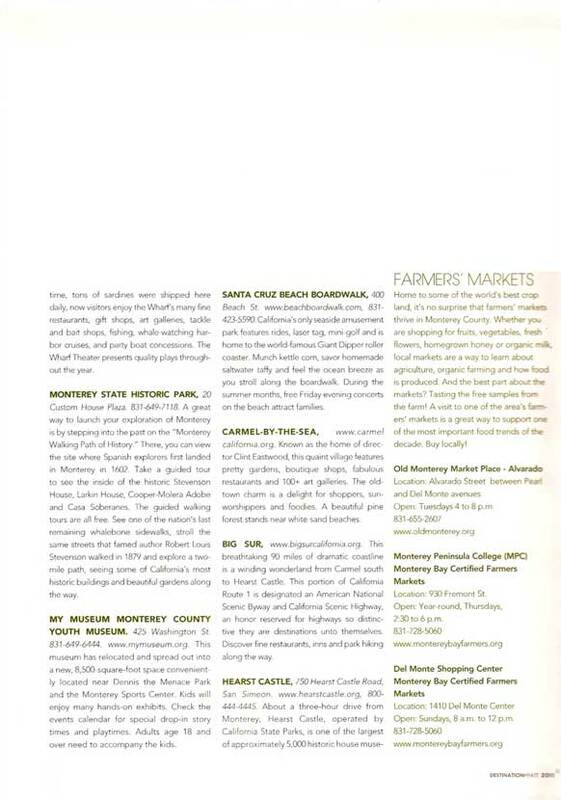 Home to some of the world's best crop land, it's no surprise that farmers' markets thrive in Monterey County. Whether you are shopping for fruits, vegetables, fresh flowers, homegrown honey or organic milk, local markets are a way to learn about agriculture, organic farming and how food is produced And the best part about the markets? Tasting the free samples from the farm! A visit to one of the area's farmers' markets is a great way to support one of the most important food trends of the decade: Buy locally! Open: Tuesdays 4 to 8 p.m.
Open: Year-round, Thursdays, 2:30 to 6 p.m.
Open: Sundays, 8 a.m. to 12 p.m. GOLF. Monterey is heaven for golfers. With dozens of public and private Courses playable year-round, in a variety of scenic settings, the Options are numerous. Ranked by Golf Digest among the top five courses in America over 100 years old, the l8-hole, championship Del Monte Golf Course, owned and operated by Pebble Beach, offers Hyatt guests preferred tee time confirmations. Spanish Bay, Spyglass Hill, Poppy Hills, Bayonet, Blackhorse and Quail Lodge are among the numerous topnotch golf courses that are just minutes away from the hotel. SCUBA DIVING. Kelp forests and an abundance of sea life in the Monterey Bay National Marine Sanctuary make the ocean and bay popular for all levels of diving - top stops include San Carlos Beach and Point Lobos. SAILING. Tours and charters leave from Monterey Harbor, taking in local wildlife and coastal views. KAYAKING. Guided tours and rental kayaks leave from Monterey and Moss Landing. All ages are welcome. WHALE WATCHING, Nothing matches the thrill of Spotting a whale when you are Out in the water. Whale watching happens year-round here, with gray whales in the winter and early spring, blue whales in the summer, and humpbacks in the summer and fall. Orcas and other dolphins are here year-round. Many chartered whale-watching tours are available from Fisherman's Wharf and Moss Landing. FISHING, Deep-sea, rock and surf fishing are popular activities. Many charter fishing trips leave from Fisherman's Wharf. Fishing regulations and license information can be obtained from the state Fish & Game Department (831-649-2870). BEACHES AND PARKS, The Los Padres National Forest and many state beaches and parks offer campsites at beaches, meadows and forests in Monterey, Big Sur, Salinas Valley and beyond. Public community parks, such as Lovers Point Park, are available for walking, picnicking, kite flying and water sports. Dennis the Menace Playground features a climbing wall, suspension bridge, giant slide, adventure ship and other child favorites. HORSEBACK RIDING. Guided tours, beach rides and trail ride packages are available near Moss Landing, in Pebble Beach and Big Sur. SKYDIVING. For adrenaline junkies with no fear of heights, this is the ticket to a memorable adventure. With expert instruction and experienced pilots, skydiving is available in the Marina at the Monterey Municipal Airport. HIKING. Monterey County's parks and recreation areas feature various trails for the day-tripper and the seasoned back-country traveler. The Monterey Bay Recreation Trail includes 18 miles of paved coastal trails for bikers, in-line skaters and runners. Point Lobos State Reserve offers a variety of trails that take you through meadows and woods and to magnificent beaches. The Big Sur area has something for everyone, from relatively flat nature trails through the trees or along the rocky coastline to challenging routes for all-day hikes. BIKING. Mountain biking is popular on the former Ft. Ord military base, which has nearly 90 miles of trails. The Sea Otter Classic, held each spring at the Laguna Seca Raceway, is one of the nation's largest bicycling festivals. MAZDA RACEWAY LAGUNA SECA. 1021 Monterey-Salinas Highway, Salinas. 831-242-8201. 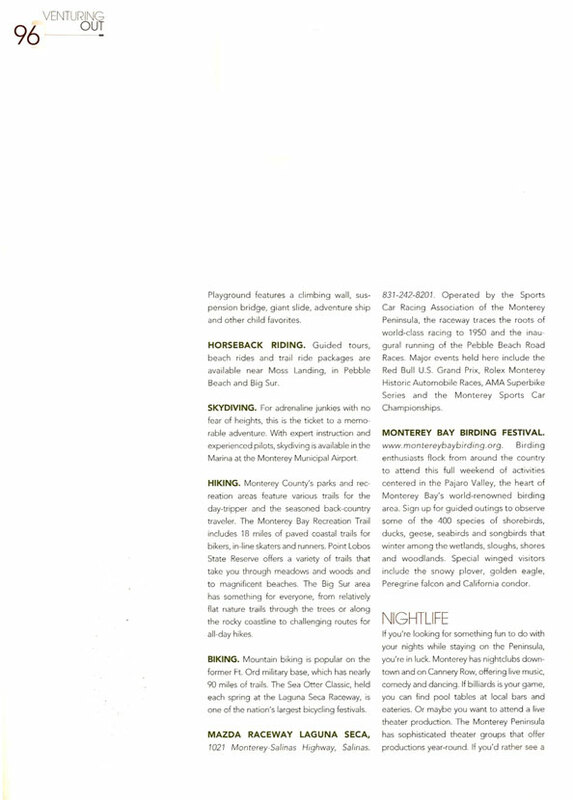 Operated by the Sports Car Racing Association of the Monterey Peninsula, the raceway traces the roots of world-class racing to 1950 and the inaugural running of the Pebble Beach Road Races. Major events held here include the Red Bull U.S. Grand Prix, Rolex Monterey Historic Automobile Races, AMA Superbike Series and the Monterey Sports Car Championships. MONTEREY BAY BIRDING FESTIVAL. www.montereybaybirding.org. Birding enthusiasts flock from around the country to attend this full weekend of activities centered in the Pajaro Valley, the heart of Monterey Bay's world-renowned birding area. Sign up for guided outings to observe some of the 400 species of shorebirds, ducks, geese, seabirds and songbirds that winter among the wetlands, sloughs, shores and woodlands. Special winged visitors include the snowy plover, golden eagle, Peregrine falcon and California condor. If you're looking for something fun to do with your nights while staying on the Peninsula, you're in luck. Monterey has nightclubs downtown and on Cannery Row, offering live music, comedy and dancing. If billiards is your game, you can find pool tables at local bars and eateries. Or maybe you want to attend a live theater production. The Monterey Peninsula has sophisticated theater groups that offer productions year-round. If you'd rather see a movie, you can catch a current film at multiscreen theaters at the Del Monte Shopping Center and many other locations. For a bite to eat after your night on the town, you will find restaurants that serve late-night fare and lounges that cater to night owls. Small coffee shops, popular with locals, are bustling with activity well into the evening. On the weekends, the coffee shops often serve up live music alongside lattes and cappuccinos. Brew pubs are also a popular place to enjoy the local nightlife. Whatever your taste in music - blues, jazz, Bach, Dixieland or reggae - Monterey has a seasonal music festival for you. These well-established, multiday festivals attract some of the biggest names in the music business. Check with the Monterey County Visitor Center (www.seemonterey.com. 888-221-1010) for dates of upcoming events, like the unique Monterey Cowboy Poetry and Music Festival that features a Saturday night Western dance. For jazz lovers, don't miss the Monterey Jazz Festival. Established in 1958, it is the longest.running jazz festival in the world. Held every September on the oak-studded Monterey Fairgrounds, the festival features 500 top Jazz artists performing throughout the weekend. Past artists have included Dave Brubeck, the McCoy Tyner Trio, 2006 Grammy Award winner Dianne Reeves and blues superstar Bonnie Raitt, a nine-time Grammy Award winner. During the Monterey Jazz Festival, some performers make spontaneous appearances (as Wynton Marsalis did) at Hyatt's Fireplace Lounge. Year-round, the lounge is a sought after spot for live jazz on weekend nights. Monterey is a food lover's paradise and a premier dining destination, thanks to bountiful fresh produce, superb seafood and an impressive variety of restaurants. Ranging from casual, family-style eateries to white-linen fine dining, there's something for every budget. Top-notch chefs, a growing number of regional vintners and a rich assortment of cultural influences mean wining and dining here has never been more exciting. Superior dining begins with the farmers in Monterey County's Salinas Valley who grow a cornucopia of fruits and vegetables. Recognized as the "Salad Bowl of the World," Monterey County is best known for its tender lettuce, tasty Brussels sprouts, luscious strawberries and tasty artichokes. In addition to first rate, multibillion dollar vegetable crops, wine grapes, nuts seeds and flowers also thrive in the region's temperate climate and rich soils. Monterey Jack cheese, which originated here, IS a popular topping on many dishes. Aside from the incredible quality and abundance of fresh ingredients, the Monterey Peninsula is also blessed with an eclectic mix of ethnic cuisine. The adventurous diner can sample a variety of textures and styles at one of many Thai or Pacific Rim restaurants, or sample authentic flavors of Mexican and Italian cuisine. (Of course, if you crave a hamburger, you can find that easily, too.) Don't miss out on the seafood: Squid, scallops, oysters, salmon, sole, halibut, red snapper, ling cod and swordfish are brought in daily by fishermen whose families have harvested from the local bay for generations. Monterey Peninsula's Native Americans, Spanish, Italians, Greeks and Portuguese brought unique talents for sea. food preparation. Chinese and Japanese cultures inspired another form of preserving and preparing fish through the canning and fish salting industries. Italian cuisine enjoys a rich history in Monterey. At Hyatt Regency Monterey Hotel and Spa's Tusca Ristorante. Executive Chef Mark Ayers captures the flavors of Tuscany, utilizing the freshest local, seasonal produce. Homemade bread hot from the oven is a perfect way to start a fantastic dinner, After your antipasti, insalate and pasta, be sure to save room for dessert - the creamy tiramisu and cheese tasting plates are TusCA favorites. 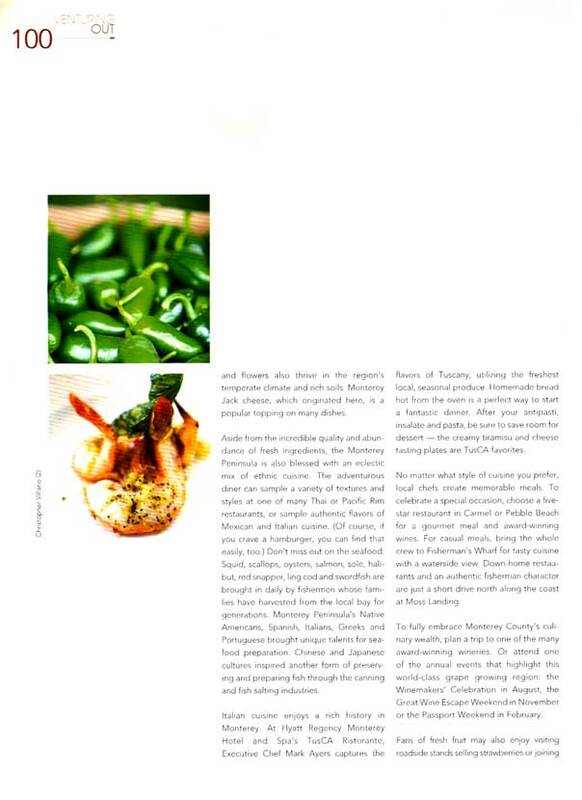 No matter what style of cuisine you prefer, local chefs create memorable meals. To celebrate a special occasion, choose a five star restaurant in Carmel or Pebble Beach for a gourmet meal and award-winning wines. For casual meals, bring the whole crew to Fisherman's Wharf for tasty cuisine with a waterside view. Down-home restaurants and an authentic fisherman character are just a short drive north along the coast at Moss Landing. To fully embrace Monterey County's culinary wealth, plan a trip to one of the many award-winning wineries. Or attend one of the annual events that highlight this world-class grape growing region: the Winemakers' Celebration in August, the Great Wine Escape Weekend in November or the Passport Weekend in February. Fans of fresh fruit may also enjoy visiting roadside stands selling strawberries or joining the "pick-your-own" crowd for whatever is in season. For an insider's view of the industry, ask your concierge where you can take a farm tour, sometimes led by local chefs. 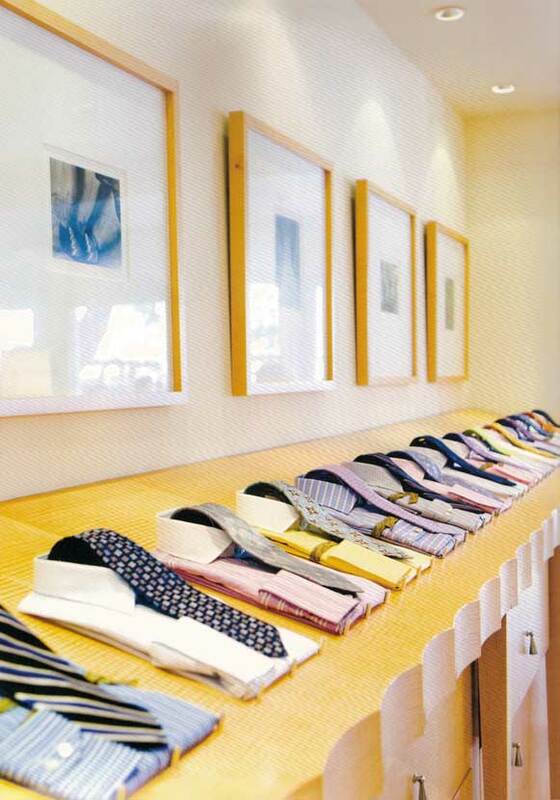 A world-class area deserves fabulous shopping. The Monterey Peninsula is sure to entice even veteran shoppers with its engaging variety of stores. Whether you enjoy shopping for designer clothes at upscale boutiques or hunting for deals at discount outlets, you'll have plenty of options. If you prefer to search for antique furnishings or are trying to locate the ideal novelty items for souvenirs, the malls, districts and streets offer a mix of major retailers, intimate specialty stores, galleries and craft shops. One of the joys of shopping is the sense of exploration. Shopping in Carmel is truly a unique experience. While very cosmopolitan in its quality of service and style, Carmel enjoys a fairly rural setting. Thanks to its European flavor, Carmel has been dubbed "the Carmel Riviera." The main street, Ocean Avenue, leads to adjoining blocks, which also have some exceptional shopping opportunities. These range from shopping centers .0 small boutiques, jewelry stores and the art galleries for which Carmel is well-known. If you spend a relaxing afternoon Of ow sing in one of Carmel's many nooks, alleyways and mini-malls, you will most likely discover a treasure that you must take home with you. Del Monte Shopping Center is a favorite destination for shoppers. The modern and stylishly designed mall features 85 shops, restaurants and services, all in a beautiful garden setting. Centrally located with easy freeway access and plenty of free parking, the mall includes stores like Macy's, Whole Foods Market, GAP, The Body Shop, Sunglass Hut and many more. If you need a break from browsing, stop in for a bite at one of the eateries or catch a movie at one of the state-of-the-art theaters. Looking for art? 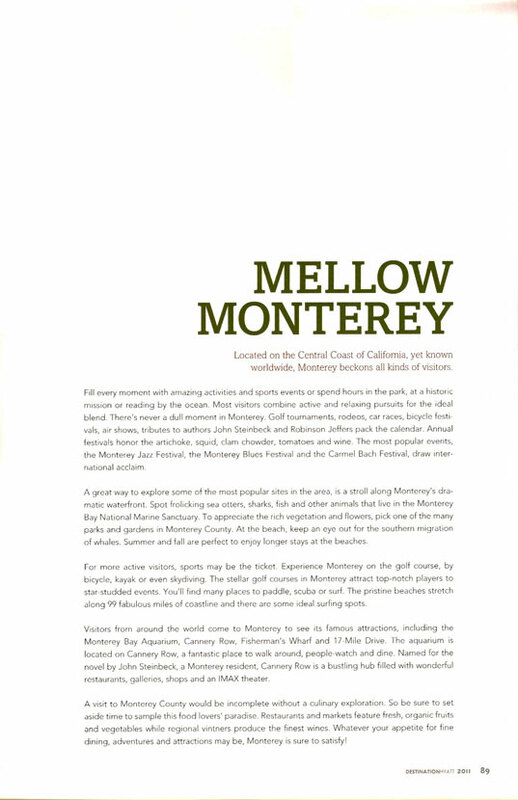 The Monterey Peninsula can keep you busy for a long time. More than 125 galleries and artists' studios are spread throughout Monterey County, a haven for artists inspired by the dramatic landscape, craggy coastline and wildlife of the area. 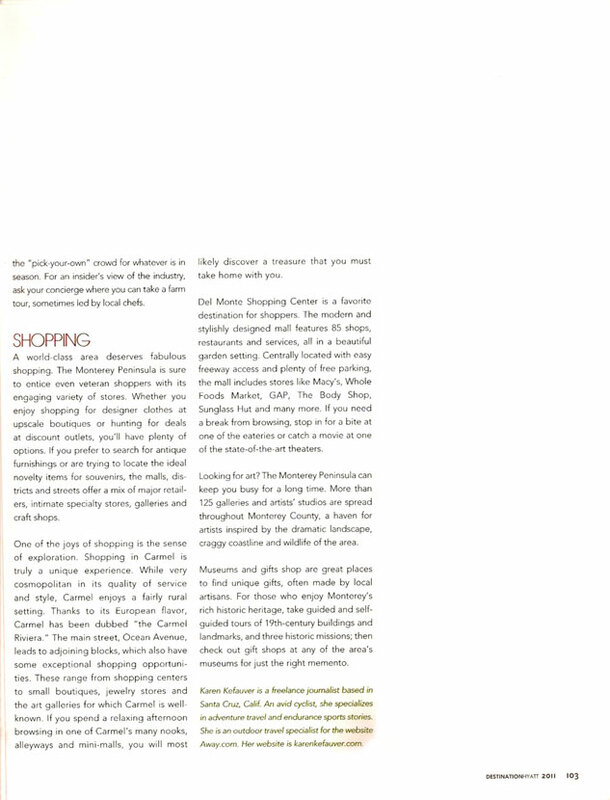 Museums and gifts shop are great places to find unique gifts, often made by local artisans. 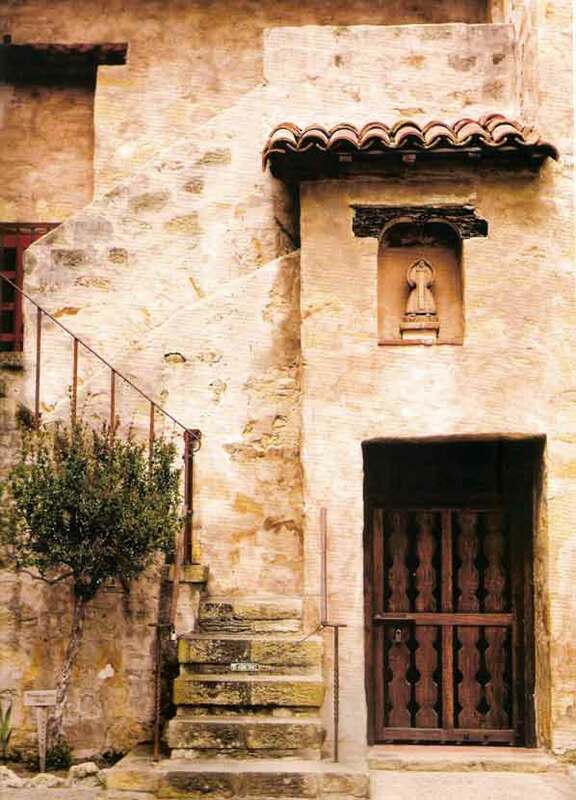 For those who enjoy Monterey's rich historic heritage, take guided and self guided tours of 19th-century buildings and landmarks, and three historic missions; then check out gift shops at any of the area's museums for just the right memento. Karen Kefauver is a freelance journalist based in Santa Cruz, Calif. An avid cyclist, she specializes in adventure travel and endurance sports stories. She is an outdoor travel specialist for the website Awaycom. Her website is karenkefauver.com.